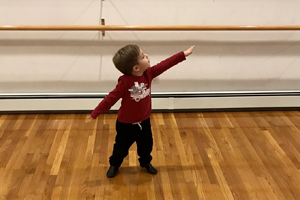 Dance classes at Soaring Dance Theatre are all about the beauty and joy of movement and the sheer delight found in dancing. Students range in age from 2 years old through adult. The youngest children learn in an atmosphere of fun, laughter and creative expression. Older children focus more on technique and have many opportunities to explore movement improvisation and choreography as well. Our dance recitals reflect the dance skills learned throughout the year and are inspiring and memorable. All students gain a sense of self esteem, grace and beauty as a result of their dance studies at the Soaring Dance Theatre dance studio. These classes are based on the creative teaching experiences of Roberta Monkash a New York State certified dance and music educator who is also a professional dancer, choreographer and musician. These classes are not associated with any franchises. We pride ourselves in offering small class sizes so students can receive the most attention and instruction. Our focus is not on an expensive year end recital, like that of other dance companies. Come in for a free studio tour to learn what makes us great! Soaring Dance Theatre is happy to announce its new expanded hours. We now offer several engaging pre-school music and dance classes that are sure to delight. Sign up for one of these classes before August 15 and receive an introductory special price of 10% off of your first tuition payment. Explore our list of dance classes for kids and adults below! Dance Classes: All Open for Registration Now! Students participate in music and dance activities sure to bring on a smile. Songs, percussion instruments, and a myriad of dance props enhance the fun of this half hour activity-filled class. The class is offered on Mondays from 11:00 – 11:30a.m. and on Thursdays from 3:00 – 3:30p.m. The children will play a variety of instruments, sing songs, and acquire the basic skills of musical rhythm, melody and creation. This enjoyable class is surely a stepping stone to any musical pursuit to follow. This class meets on Wednesdays from 3:00 – 3:30p.m. A delightful introduction to the world of dance! Charming and fun-filled classes utilizing props, lovely music and creative props. Small class sizes ensure that students are engaged throughout and not waiting for their turn. This class meets on Thursdays from 5:00-6:00pm. Read more about Dancing Sprites here. This class is designed to immerse the young dancer into the foundation of dance. 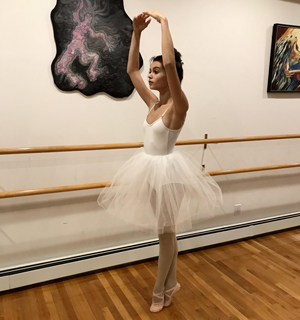 The class rotates through the year to study ballet, modern and jazz techniques. This fosters strong, graceful and creative dancers who do not become bored with the same style of movement. The dancers work with props and dance to a variety of musical accompaniments. Dance games and movement improvisation enhance the enjoyable experience in this class. Read more about our Dance Expression classes here. This class is dedicated to refining dance technique. Dancers learn the steps and dance styles of modern dance, jazz and ballet. Improvisation and elements of choreography are also explored. 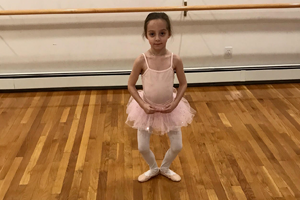 Small classes, beautiful accompanying music and an inspiring artistic environment contribute to the fulfilling dance experience of this class. Students at this level are invited to take the Ballet Technique class as well. Read more about our Dance Expression classes here. This intermediate/advanced level class is geared toward a student who wants to be fully immersed in the art of dance. A strong emphasis is placed on modern and jazz dance. Students in this class often take the Ballet Technique class as well. Read more about our Dance Expression classes here. All trained dancers should have a foundation in the study of ballet. This advanced beginner/intermediate level class emphasizes the finer points of ballet technique. The class also incorporates demi-pointe work which is a necessary prerequisite to pointe studies. Students in this class often take the DANCE EXPRESSION classes as well. This class engages in the study of pointe technique. Students must be taking DANCE EXPRESSION III and BALLET TECHNIQUE to qualify to study pointe. Admission to this class is with approval of the director. This is the Soaring Dance Theatre performing ensemble. Admission is by audition only. Performers in Soaring Dance Theatre must be taking ongoing classes in DANCE EXPRESSION III, BALLET TECHNIQUE as well as the COMPANY CLASS. Learn more here. professional theatre and for college auditions. Coaching appointments can be made by calling our dance studio. Read more here.